The Public Service exists to support the three branches of the State – the Executive, the Legislature and the Judiciary – to fulfil their mandate, which is to serve the people of Ireland. This mandate is extensive and far-reaching and, accordingly, the Irish Public Service performs a diverse range of functions and includes the Civil Service; the Health Sector; the Education and Training Sector; the Local Authorities; An Garda Síochána, the Prison Service, the Courts Service and other areas of the Justice Sector; the Defence Forces; and the Non-Commercial State Agencies. 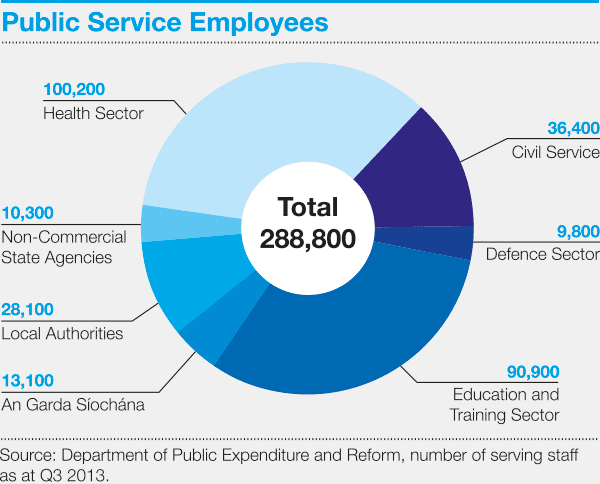 Public servants range from teachers, nurses, hospital clinicians, fire officers, town planners and social welfare officers, to members of the Defence Forces, Gardaí, engineers, inspectors of taxes, civil servants involved in frontline service delivery and strategic planning, lecturers, economic regulators, veterinary surgeons and prison officers. There are currently under 290,000 people employed in the Public Service, which has been reduced from a peak of 320,000 in 2008. A chart setting out employees by sector can be seen below. Sectoral Reform is a key element of the overall framework for Public Service Reform as set out in Section 1.2. In this section, some of the key sectoral reform priorities for the main sectors of the Public Service are outlined at a high level. The sectoral priorities, when considered alongside the cross-cutting strategic reforms set out in this document, comprise the main elements of reform being pursued across the Public Service. The delivery of these priorities is led by the relevant Ministers and their Departments.